This offers 18 off-road vehicles equipped to deal with the hazardous conditions found during the rough and ready world of off-road driving. Environments include Baja, bayou, north woods, artic circle, mountain, dry riverbed, and a secret level. Players will choose from over 12 interchangeable parts including skid plates, bumper guards, lights, and tires to find a working combination for each course. Mechanical breakdowns -- broken axles, cracked engine parts, and electrical problems -- will afflict drivers and must be fixed. It has the player test his driving skills combined with RPG elements. Each completed mission has the player accumulate experience that allows for the purchase of better parts, newer trucks and the ability to accept tougher and more rewarding missions. 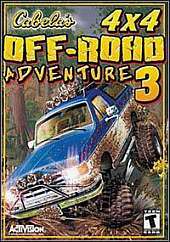 Unlike other Cabela's Off-Road titles, Off-Road 3 offers hunting with perspectives in and out of the truck.